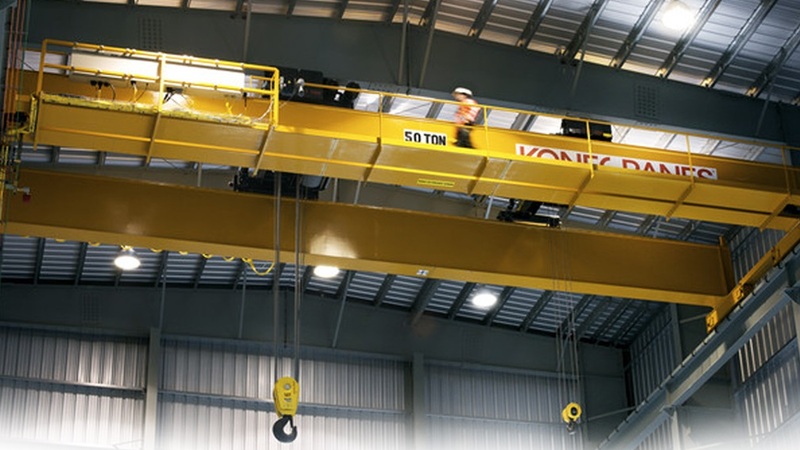 Overhead Cranes – Konecranes, Inc.
Also known as hoist cranes, overhead cranes operate from an overhead steel beam or pair of beams bridged between two structural supports; a trolley runs along these beams carrying a hoist, which is used to lift and reposition heavy loads. They are powered by hydraulics, internal combustion or electric batteries. Regardless of a crane’s configuration, overhead cranes share three basic elements of construction: each uses a bridge, a trolley and a hoist. The bridge is the overhanging arm that bears the weight of the lift; in bridge cranes and gantry cranes, the bridge spans two supports, while jib crane and cantilever crane bridges are suspended in air from one support; in these cases, the load bearing arm is often called a boom. The trolley is the electrically or mechanically powered mechanism that moves the hoist and crane hook along the bridge. The hoist is the fixture responsible for lowering and raising the crane attachment, hook, grapple, fork or auger. Wire rope or nylon cables connect the crane attachment to the crane’s main electric, internal combustion or hydraulic lift located at its base or at the top of its support, using electric motors for smaller applications and internal combustion or hydraulic power for doing larger, heavier work. Because cranes work with extremely heavy, dangerous loads, frequent inspections must be performed on overhead cranes for safety purposes. Every day the operating mechanisms must be checked for maladjustment, the pneumatic and hydraulic parts for leakage, the hooks for deformation or cracks and the hoist chains and end connections for wear, twist or distortion. The running rope and end connections should be checked on a monthly basis for wear, broken strands and other problems. Periodically, the overhead cranes should be checked for deformed, cracked or corroded components, loose bolts or rivets, cracked or worn sheaves and drums, other worn, cracked or distorted parts (e.g. bearings, gears and rollers) and excessive wear on brake system parts, chain drive sprockets and chains. Other components to be inspected include electric or fossil-fuel motors, indicators and electrical components such as pushbuttons and limit switches. OSHA has published a set of guidelines for the safe operation of overhead cranes. Overhead Cranes Overhead industrial cranes, also called lifting cranes, are materials movement machines that are essential for many industrial processes including construction, loading and unloading of large objects, manufacturing and many other operations.